Surprise – a certificate! 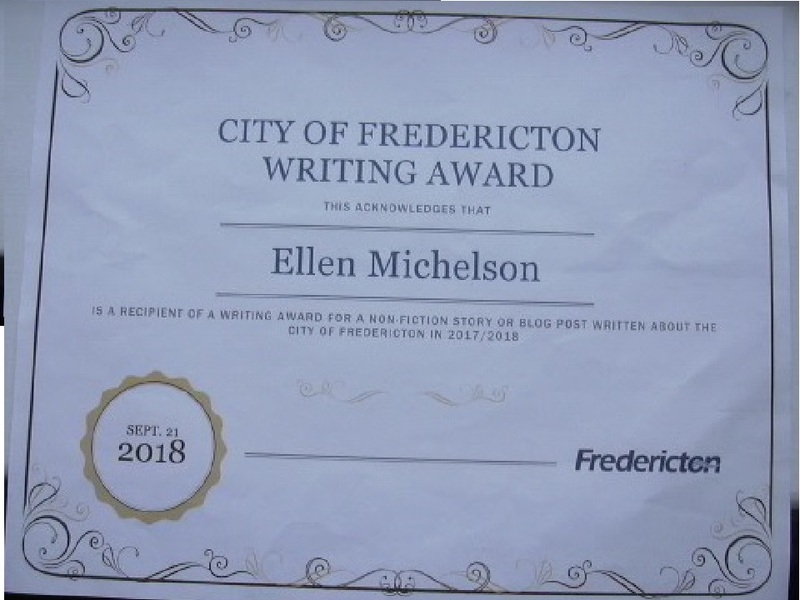 The city of Fredericton created a contest in connection with the Professional Writers Association of Canada’s 2017 meeting there. 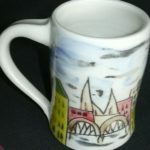 The blogpost cited several posts below (with the riverside photo) was my entry. My goal wasn’t to win. I hoped to share some of our conference with those who didn’t attend, and show appreciation to our host city. At our 2018 PWAC meeting, I received the certificate, and learned a gift package was to follow. The mug, by a Fredericton crafter, brings me happy thoughts of strolling across the river on the bridge as the shallow concavity in its handle nestles against my thumb. Fellow PWACer Doreen Pendgracs won the same award, also with a blogpost. 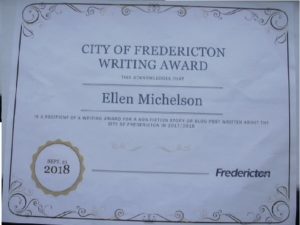 Hers is less about PWAC, more about Fredericton. Click here to explore it. If you’ve been there, you’ll recognize what you enjoyed; if you’ve not, you’ll learn about the city.